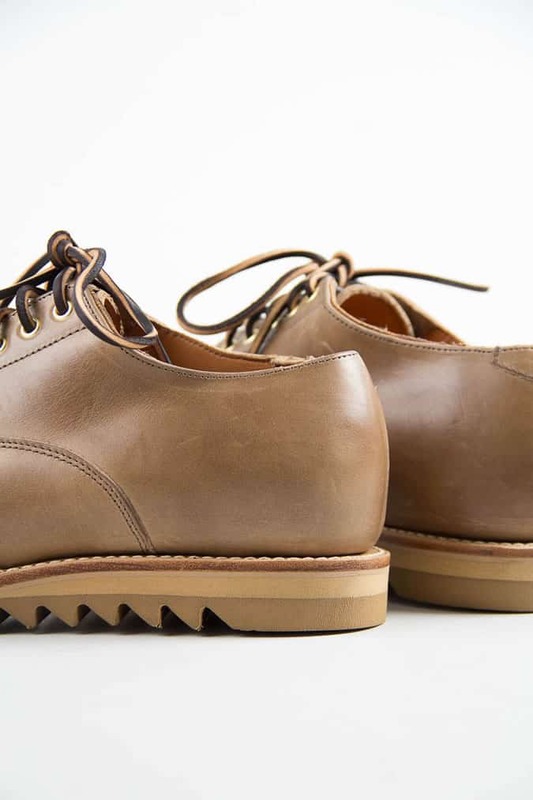 Irish store The Bureau Belfast has taken stock of two new versions of Canadian label Viberg’s Derby shoe. The collaboration offers a Black Tan Oil and Natural Chromexcel leather model of the casual style, based on Viberg’s new 1035 last. Both use a single E width fit and features a rounded toe and slim profile. The first, priced at £530, uses a rough out calf upper, gun metal eyelets and a black Vibram Gloxi–Cut sole with contrast white stitching. Meanwhile the second, retailing at £545, has been crafted with a natural calf upper, brass eyelets and a lightly shallower and lighter sand Vibram Gumlite ripple sole with contrast white stitching. Both feature tonal stitching on the upper, unstructured toe, bellow tongue and natural edge midsole. Made in Canada, the shoes are shipped with a dust bag and a set of dark brown/light brown two-tone leather and brown flat cotton laces. Founded in 1931, the Viberg company is still family owned, currently in its third generation. A cult shoe brand, it produces a variety of models including boots for hiking, hunting and biking as well as clothing and accessories. The Bureau Belfast, which has previously collaborated with Trickers and Alden, has a brick and mortar store in Belfast, which stocks the likes of Oliver Peoples and Filson. Both shoes are available to buy online now at thebureaubelfast.com and in the Belfast store.